Before taking a deep dive into the details of how a few ski brands have addressed the women’s market, allow me to restate why the women’s market is concentrated in the Frontside and All-Mountain East genres. Frontside is the category where almost all skiers, regardless of gender, begin their ski careers. In marketing-speak, the category declines in both technology and price point, meaning the Frontside family is stocked at the high end with skis made for skilled skiers and proliferates downwards until hitting a package price of $399, bindings included, for entry-level skiers. This means a large percentage of the female skiing population will begin their ski experience on a ski designed to perform at its best on groomed terrain. As their skills develop, they’ll want their next pair of skis to do one of two things: either make them a better hard snow skier by providing better edge grip and speed stability, or make it easier for them to ski off-trail as well as on-trail. The fact that many women want the best of both worlds – who doesn’t? – has driven the increased popularity of All-Mountain East models made for women. Women with this skill set can tear it up on any ski. Because of the stepping-stone structure of the Frontside segment, the category is brimming with models made for intermediates with a thin layer of creamy excellence on top. As intermediates, by definition, can use all the help they can get, Frontside female-friendly features often focus on positioning lower skill skiers for success. Also, the best men’s Frontside models are usually so heavy they make a sub-optimal template for women’s designs. Lighter weight is an essential characteristic of any women’s model, mandating at least some design modifications be applied to any unisex Frontside skis hoping to appeal to women. If you examine the 2018 Women’s Frontside category, there are two qualities intrinsic to all – shorter sizes and alternative cosmetics – and two that frequently pertain: a slightly more forward mounting position and a change in core composition. The change in binding position should help a woman with a lower center of mass to apply forward pressure to the ski. The switch in core construction is always about losing weight. Also on a female skier’s wish list is a tighter turn radius, as women in general prize control over speed, a desire that is automatically addressed with shorter lengths but may be augmented in some women-specific designs. 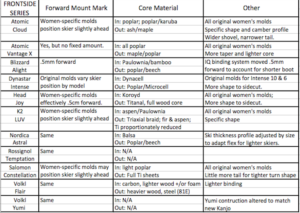 To help abbreviate the narrative, the table below summarizes the adaptations made to women’s Frontside skis from nine major brands. The take-away from this busy grid (sorry, mobile users), is that ski makers have adopted a variety of approaches to the made-for-women market. Five use women-specific molds in a Frontside series, but almost all revert to piggybacking on unisex designs in the next widest category, All-Mountain East. The investment in specialized molds in the Frontside genre is well worth it because of the size of the women’s market in Europe, where on-piste skiing is the norm. When worldwide production has to depend primarily on the North American zone to sustain it, it’s harder to justify women’s-only tooling. And yet, the most popular ski of the last two seasons – in the entire American market, not just among women’s skis – has been Blizzard’s Black Pearl, an 88mm-waisted All-Mountain East model. The Pearl’s anomalous success was teed up by its relationship with Blizzard’s unisex Flip Core design; then as now, the Black Pearl 88 shares tooling with the men’s Brahma. Rather than rest on its initial success, Blizzard invested in creating a women’s-specific construction for its All-Mountain star, importing unidirectional carbon from its backcountry skis (in lieu of heavy glass), and recently tweaked its shape to make it a tad more turny. The runaway success of the Black Pearl didn’t go unnoticed at corporate HQ. Its contributions to the bottom line secured a commitment from marketing and R&D to seize the opportunity the Pearl created. Blizzard applied the same formula piloted by Tecnica in its Mach research project: talk to the affected market before you make the product, rather than asking opinions about already-made prototypes. Women who can rip it like this use the same skis as men, albeit in a shorter length. The resulting Women to Women campaign blends marketing, communications and R&D with the objective of developing better women’s gear. As manifested in Blizzard’s 2018 ski line, W2W is an evolutionary process that so far has inspired three different women’s-specific constructions in its Frontside, All-Mountain and Big Mountain series. The next frontier is to explore adapting construction down to individual sizes, as women on, say, a 153cm will have different preferences than a woman on a 173cm. Blizzard’s intensified focus on women’s needs is hardly unique. K2 is well known for its long-standing use of women testers in the development of its women’s models. Head developed the Joy series in advance of exploiting the same materials in a unisex model. Nordica adapts core thickness and attendant flex pattern by size, so even models that use a unisex construction are tailored by size to perform for lighter skiers. Atomic conducted research on women’s models in conjunction with the University of Salzburg, leading to the creation of its women-specific Cloud series. Völkl has been interrelating flex, sidecut, positioning and ramp angle for generations of women’s Frontside skis. What have we learned from this penetrating exegesis? First of all, there’s not one female skier archetype but several, and the needs of one sub-set don’t automatically align with the needs of another. 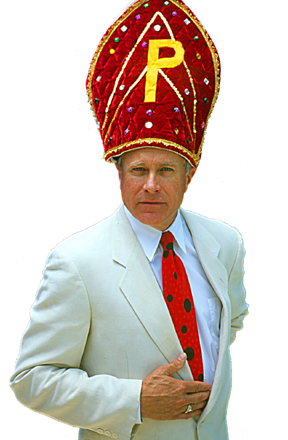 (For example, lower skill skiers have different requirements than advanced skiers.) Second, while all brands might agree that women like lighter equipment, they all go about lightening up their product lines in different ways. Third, that the LIB movement across all consumer goods and the surge in interest in backcountry in particular made ski R&D departments more focused on lightweight solutions whether applied to men or women. As skis grow wider, the need to eliminate excess weight serves both genders equally. The cross-category interest in reducing mass while maintaining stability means that all women benefit from the current market obsession with weight whether they buy a “women’s” ski or not. Next week we’ll take a closer look at some of the more interesting developments in women’s ski design and see if we can divine where the women’s market might be headed in the near future.